This week, we got the last three Elephant and Piggie books by Mo Willems from the library. We absolutely love this series, as I discussed here. We also picked up Don't Let the Pigeon Drive the Bus by Willems. C has been reading that one this week. Actually, we have some friends visiting this weekend, and C has been reading some of Willems' books to them each night before bed. It's pretty cool to see your kid reading bedtime stories to other kids! This is a cute book about a pigeon trying to convince the reader to let him drive a bus, after the driver has told the reader at the beginning not to let him. The kids all seemed to enjoy it. M picked out another cute book called Little Red Riding Pooh , which is obviously an adaptation of the Little Red Riding Hood story. In this one, Pooh is on his way to grandma's house, and Tigger is the strange looking wolf. It's a much gentler version of the story, with Tigger posing as Grandma because he wants the honey Pooh is carrying. Grandma comes in, alive and well, and offers him some vegetables. There's no eating of Grandma in this story, which is nice! We got several other books from the library this week, but haven't read them yet. So next week, I'm sure I'll have a lot more to share! What have you been reading with your children this week? 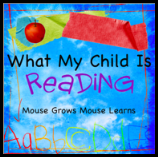 Hop on over to Mouse Grows Mouse Learns to share! And if you're interested in a winning a book for you to read yourself, check out my current giveaway! We have another book in the pigeon series about him wanting a dog, it's super cute! The Winnie the Pooh sounds interesting, but my kids never got into Winnie the Pooh. These both sound like cute books. Though Selena never did really get into Winnie the Pooh. We love the Pigeon books and have been reading the Hot dog one this week!